Another casualty of mobile knitting. 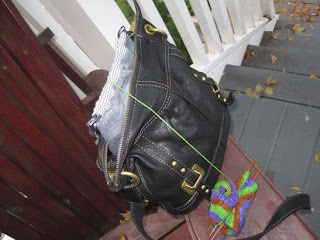 I was not paying attention to my bus stop and jammed the needles into my bag as I got up, then zipped my purse shut on the way to the doors. Still without paying attention, apparently. Closer investigation at home showed that the cast-on tail was caught in the zipper pull, and though it was pretty close to the first stitches and one of the three plys had come close to tearing, it was possible to wriggle it out again with some back-and-forthing of the pull. I was even able to run in that cast-on tail without anything being the worse. 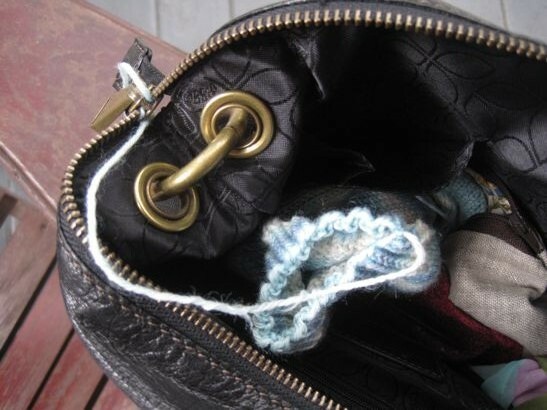 When I'm using a purse with a zip on public transit, as opposed to an open tote in a car, I knit from a drawstring bag raised a little above zip level. Hope you have a good and snarl-free weekend! You know what I'll be doing: baby sweater baby sweater baby sweater.